There are many health benefits of pomegranate juice. The most important is the antioxidant properties. The ORAC (antioxidant capacity) of pomegranate juice is measured at 2,860 units per 100 grams. Because of its high antioxidant content, it can help support your body's health in many different conditions. Pomegranates are relatively pricy comparing with lemons and carrots which I highly recommended for juice fasting. However the health benefits of pomegranate juice are really impressive and will certainly justify your investment. I have therefore named it as the best of red on my juicing for weight loss color rotation list. In fact, pomegranate juice is not only for juice fasting, it’s going to be your new wonder health drink. 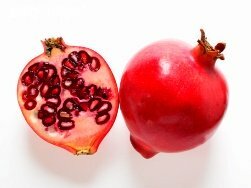 Forget about green tea and red wine and start to enjoy the health benefits of pomegranate juice. To start, a glass of pomegranate juice contains about 40% of the US Recommended Daily Allowance (RDA) of Vitamin C. It also has Vitamin A, E and folic acid in good quantities. As pomegranate juice has antioxidants, in some clinical studies, it has been shown to be of significant benefit in the prevention of heart disease. Drinking pomegranate juice every day can increase blood flow to the heart, resulting in improved heart function. It can prevent the build-up of plaque in arteries and can possibly reverse or decrease the amount of buildup already present. Pomegranate juice contains Anthocyanins which help strengthen the walls of the tiny blood vessels which in turn supply the skin with the nutrients that it needs. One of its most unique health benefits is to prevent the appearance of varicose veins. Research reports indicate that pomegranate juice has antioxidants that can reduce LDL (bad cholesterol) and increase HDL (good cholesterol). Other research reports suggest that pomegranate juice might help reduce the risk of breast cancer. Do you notice that more and more people are suffering from dementia? Nowadays, dementia is not a symptom of aging, it attacks young. According to the World Alzheimer Report published in September 2010, European researchers estimate about 35 million people have dementia worldwide. Alzheimer’s disease is the most common form of dementia. The report indicates that "Alzheimer’s disease and other dementias are the single most significant health and social crisis of the 21st century." Drinking pomegranate juice every day does not only increase blood flow to the heart, but strengthening our blood circulation in general, resulting in preventing the Alzheimer’s disease. As there is no known cure for Alzheimer’s, why not taking preventive measures such as drinking pomegranate juice on a regular basis? The health benefits of pomegranate juice become increasingly attractive, due to the fact that antioxidants are believed to play a part in Parkinson’s disease, Alzheimer’s disease, cancer and other age-related diseases, such as arthritis and even pre-mature aging. The greatest thing about all these benefits is that you can get them while drinking a delicious and refreshing drink. Pomegranate juice is non-alcoholic, is delicious when served chilled or iced, and can be used to make a number of interesting and exotic dishes. How To Make Pomegranate Juice ? Juicing of fresh pomegranates is quite an easy task. Cut a pomegranate into half and juice them with the help of a citrus reamer or juicer. The juice thus obtained need to be strained through a cheesecloth-lined strainer and the juice is ready. Normally, 2-3 large sized pomegranates are required to get one cup of pomegranate juice. It’s perishable. So drink it as soon as you make it or keep in refrigerator and drink within hours. You can drink either straight or mixed with other fruit juices such as apple or cherry.